Cats don't get aggressive out of nowhere. An aggressive cat is usually behaving that way for a good reason. 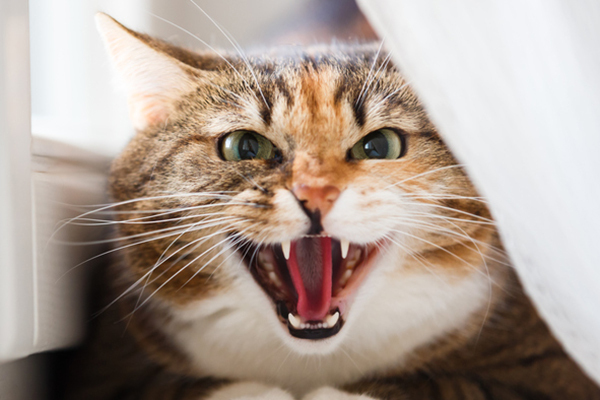 Here are seven reasons why cats become aggressive — plus the warning signs and how to handle each. Even the most experienced cat caretakers can find themselves charged up on adrenalin when having to face a cat in the midst of a fit of aggression. But encountering a hissing, growling, screaming, and possibly even scratching and biting cat can strike terror into the hearts of people who don’t know how to handle an aggressive cat. But cats don’t just suddenly go crazy: There are almost always warning signs and there’s almost always a good reason for cat aggression. 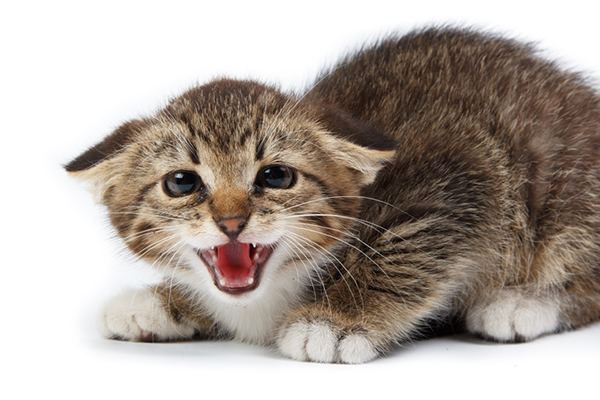 Here are seven reasons why cats become aggressive and how to handle an aggressive cat. An aggressive cat might be responding to pain. Photography ©points | Thinkstock. Cats who are in pain will respond with hisses and swats when sensitive areas are touched. My cat, Siouxsie, does this if I accidentally put pressure on her sore hips. A hard yank on the tail, for example, can be quite painful. Ignore the warning signs and a scratch and possibly even a bite may follow. This is especially true if the pain is a result of physical abuse such as being kicked or hit. 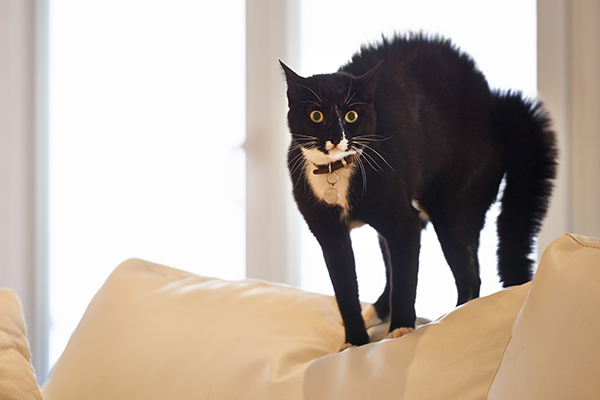 A terrified cat will respond with body language that’s obvious to an experienced cat caretaker: She will turn sideways and puff up her tail and fur in order to look larger. Her ears will flatten backwards, she will hiss and her pupils will dilate. Attempting to approach a cat in this state is risking an aggressive reaction, not because the cat dislikes you but because she’s in the middle of a panic reaction. A cat who is not spayed or neutered is much more likely to be aggressive. 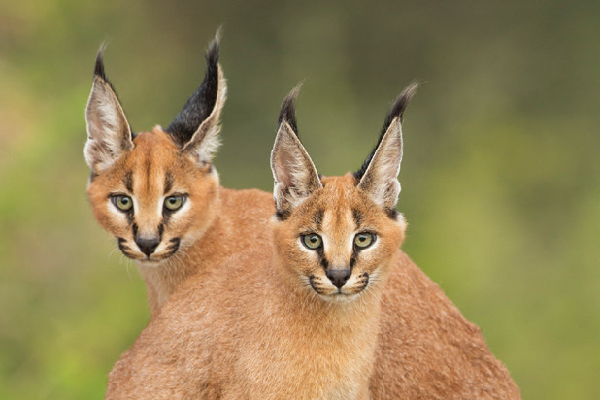 Male cats in particular are biologically wired to fight with other male cats when females in heat are present. If you see two cats fighting, do not physically intervene because you will almost certainly become the target of the cats’ aggression. “Redirected aggression” is the term for violent acts carried out by cats because they can’t reach the object of their predatory passion. For example, an indoor cat who sees another cat walking by or marking his territory in “his” turf may get into a highly reactive state. At that point, anyone unfortunate enough to be nearby, whether that’s another cat, a dog or a person, may end up on the receiving end of the cat’s aggression. 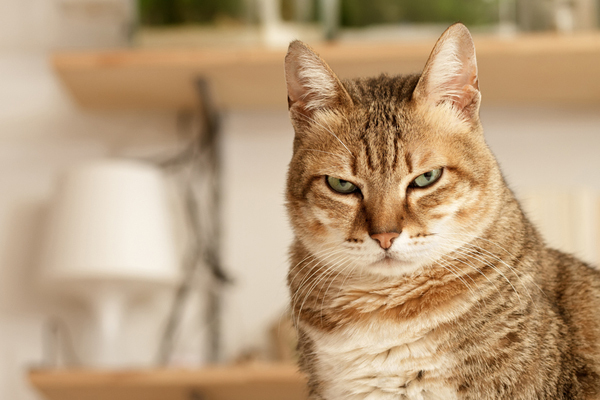 An aggressive cat may be responding to stress within your home. Photography ©Ornitolog82 | Thinkstock. If a cat lives in a highly stressful environment — for example, a home in which people are fighting or a home with too many cats — it’s quite possible for that cat to be quick to respond aggressively. Like children who live in homes with a lot of verbal and physical violence, or a lot of unspoken anger, cats often act out the dynamics of their human families. Don’t laugh: Cats can suffer from post-traumatic stress. Their brains are wired similarly to ours, and the effects of chronic anxiety from past human violence or struggling to survive on the streets can lead cats to become aggressive. In order to resolve this issue, a short course of anti-anxiety medication (prescribed by a vet, of course; don’t give your cat your antidepressants, please), homeopathic remedies or flower essences can help make a cat less reactive to triggers. This is by far the rarest reason for cats to become aggressive. 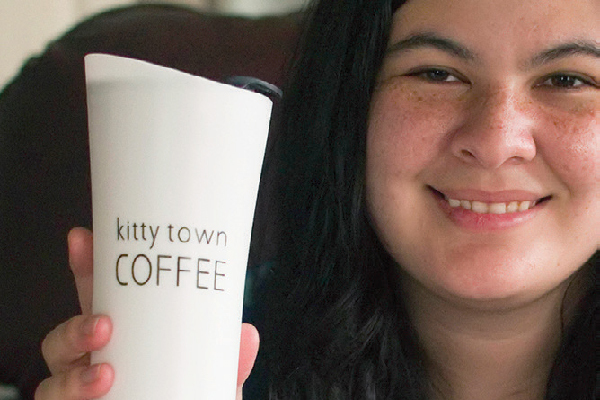 But like humans, some cats simply have biochemical imbalances that affect behavior. For these cats, antidepressants or anti-anxiety medications can be a lifesaver. No matter what the cause of the aggression, there are almost always warning signs. If you understand feline body language, you’ll be able to see that your furry friend is getting wound up before the situation escalates to a crisis point. If you have a highly reactive cat and you want to help him or her, be aware that it will take time and patience — but take it from a person who has rehabilitated traumatized cats: The reward is so worth the effort! Tell us: How about you? Have you had an aggressive cat? Were you able to help your kitty feel better and become less reactive? What did you do to help her? Have you ever been unable to help an aggressive cat? Share your thoughts in the comments. Thumbnail: Photography by elwynn / Shutterstock. My grandson cat, Theo, has come back to live with me. He used to live with my daughter. He has always been an indoor cat. I have a screened back porch that he would love sitting out on all day! I also have dog that Theo grew up with. I started letting him out on a leash and harness. He loved it. He now goes in/out the doggie door and absolutely loves it. Just recently after my daughter came to visit, Theo ran and hid from her. Then he has been very aggressive at night towards the dog and us. Now for the past couple of weeks he has been consistently aggressive just about every night. We thought maybe he is/was mad at my daughter and acting out. Maybe it is because he has been going outside. Any insight? I think I remember that he has had several “”bouts”” of aggression, even before coming back to stay with me. He also has a constant stuffy nose and sinus trouble. Could that have anything to do with aggression? I have a female, formerly feral cat who has become aggressive toward the other cats in the house, but more affectionate with me. When I first rescued her, she preferred the company of cats and avoided me, except at feeding time. Now, she’s done a complete 180 – follows me around the house, sits on my lap and swats at the other cats, including her kitten (I rescued both before winter set in.) I think she was the queen of her feral colony, so is she trying to re-establish her place as head of the tribe now? I have a 8 year old female non-spayed cat and a 8 year old (soon to be 9) year old spayed dog(shepherd/pointer/pit). Both have been living together, sleeping together, playing for several year now. A few days a go I came back from walking the dog and while my dog was drinking her water, my cat jumped at her with all four sets of claws out and attacked her. My dog was afraid so she backed away but the cat came chasing after her, hissing and swatting. I stepped between them and my cat tore my arm up, bit and scratched my legs and feet. My cat now stalks and antagonizes my dog. My dog is starting to be afraid to walk around the house. I notice when she comes home after I walk her she starts to shake before we get in the door and she won’t go near the room the cat is in, even with the door closed. I have them currently separated as much as possible. HELP?! My cat Lilly is two years old, she has become very aggressive. Every morning and night she will pounce on me and my partner and will not let us walk around without her attacking us, she makes a crying sound while doing this. she is fine during the day and i’m unsure what im spouse to do as it’s getting out of hand i have sctraches all over my arm and i can not walk around my house during these times incase she attacks. We have moved houses 4 times due to building and renting but she has always been in these moods but it has gotten ALOT worse. What do i do? My cat who is 14 years old always was a very loving cat and about a year ago she had te go on a diet because she’s overweight. She is now very aggressive and randomly attacks me. Could this be because of the diet? And should i take her of it. We’re sorry to hear you’re experiencing this. 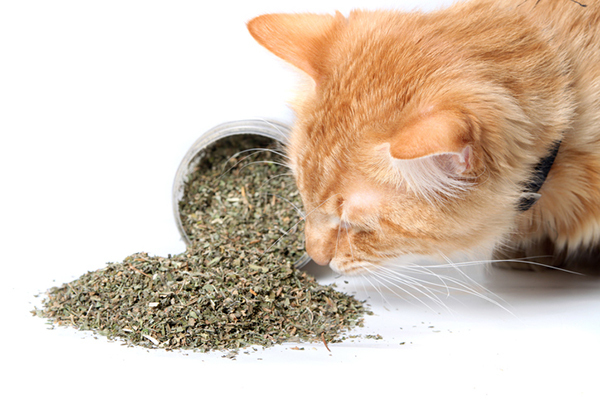 We suggest asking a vet for the best advice when it comes to cat diets. I moved in with my bf, he has a cat & I have a cat. Both are female, 2-2.5 years old and fixed. They were separated for 2 days, one in living room and one in bedroom. They have separate cat litter and food. I wipe their scents onto each other. Then they were introduced to each other in 2 separate carriers. I’ve also brushed them with the same brush and tried to mix the scents, but my cat growls & hiss at the brushes too. They were introduced to each other on 4th day, with toys and snacks for distractions. They didn’t fight, only hissed at each other. Over the last week, his cat has calmed down, no more growling or hissing or charging at my cat. However, my cat is still making growling, hissing and loud screaming. They had been eating in each other’s bowl and using each other’s litter box even thought it’s at different places. My cat stays in the room while we’re asleep. And it seems like she acts territorial with the bed or me? And growls extremely loud when his cat try to come into bedroom. They do this like 5-6 times throughout the night. The way his cat meows, sounds more familiar now. But my cat is still growling reallllllly loud. Any suggestions? Thank you in advanced! Our 9 yo, female (not spayed) cat, has suddenly become aggressive to the other 3 neutered male cats. Her belly looks like she’s pregnant, but she is a strictly indoor cat making this IMPOSSIBLE. We have had her and her siblings since birth, they all cohabitated, without any problems, to this point. Now she goes on the attack on the male cats and it scares them and us. Should we take her to the Vet? We suggest contacting your vet for advice if this behavior continues or gets worse. I have a cat, now almost 3y/o, rescued from the street, nursed to health. She always had a weird behavior. Doesn’t meow often and showed very little affection but would sleep next to myself and spouse in bed, or my son. Would also sleep on the foot rest of our recliners and would allow us to hold her occasionally. All of a sudden she is aggressive, hissing, slapping, growling and screaming whhen we get close. She is so aggressive currently for a few weeks and I cannot catch her to take her to the vet..no idea what to do. A year ago I lifted a kitten lying near the garbage bin. She has now grown and given two kittens who are two months old. I guess she is now again a month pregnant. My cat has all of a sudden started behaving rudely to her kittens. Few days back she couldn’t live without then would cry if they are not around, calling them, searching them. But now all of a sudden a different behaviour. Can you help me out with the reason for this kind of a behaviour. She isn’t allowing anyone next to her. I tried checking if any wounds on her body but everything seems fine. Take her to the vet. Consider getting her fixed , perhaps she’s had rough of being P.G. Also encourage people to adopt kittens rather than breed because to many are homeless. You sound like a good fur baby mom. My cat is docile and can usually be picked up and cradled like a baby. Over the last two days, he has reacted in a ‘spooked’ way when my husband picks him up and literally jumps out of my husband’s arms. He has badly scratched my husband in the process of trying to get away. My cat doesn’t react this way with me at all. He follows me around and loves to be held and fussed on. He was a stray before we adopted him, so we don’t really know his history past that. My cat is 4 1/2 years old and other than going away for a couple of nights a week, my husband is usually home with him. I don’t know why this behaviour has started. Any advice? I adopted my (2 y/o neutered) cat about 6 months ago. She was energetic and felt at home quickly. Then, I let her out in my backyard and have continued doing so for a few months. Now that it’s raining season, I have tried to keep her inside and she tries to escape every chance she gets. She’s also aggressive towards the neighbour’s pets. What are the things I can do to curb her wild behaviour? My cat is very attched to me. There was point where be does not allow me to put him down. He wants me to carry him. Once i put him down he gets angry and wanted to attack me. 1 mth prior to that he attaccked me bcos he can sence pregnant cat was at the door outside. He got angry and attacked me viciously. What can i do? Now i put him in a small room by himself. Lure him into a carrier to lock him up before i clean up his room n litters and give him food and water. Please advice…i miss touching and hugging him. I’ve had a cat since he was 8 weeks old..he is neutered and 12 yrs old..inside cat all his life..apparently always docile and allowed me to pet him even on his stomach..out of the blue, without provocation and while letting his stomach, he turns on me and bites my arm hard..I’m concerned and shocked at his reaction..he is healthy and with no medical issues..I appreciate your opinion..thanks..! The day she was spayed, my feamale cat attacked me really bad, and I yelled and ran and she kept scratching me and biting me until I got out of the house. Then one or two weeks after, my cousin scared me and I must have yelled the same way, that the cat attacked my cousin, I don’t know if she was coming for me but I ran and she got my cousin the same way she attacked me. Now three months after being spayed we brought her to another country, also she might have gotten nervous because of a sound or the amount of people in the house and she came to attack and since I cannot react another way I just started yelling and running again and she kept following me and then kept acting really aggressive. Does any of these things are linked or could anyone help? I have 2 female cats(sisters). They’re 6 years old and lately are growling and hissing at each other. And now are urinating and pooping outside the litter box. I had the one checked by the vet and she’s fine. He said it was behavioral. I use that feliway and nothing helps. Any suggestions? I left to go interstate with my family 5 yrs ago & couldnt take my cat with me as we were staying with friends for a short period of time & didnt have a home. My female cat was very close to me,always slept close and never went to anyone else. I did eventually find somewhere but when I returned to get her,she didnt want a barr of me and she was extremely aggressive. She flicks her tail at me when im not near her and runs away. I have not been able to take her back home with me. I visit my parents and its always the same. I have had “moments” where shell purr and let me touch her,but mostly she “hates me”..
She was such a beautiful cat..
She not only does it to me,she does it my mum and sometimes when shes lying near my dad and hes gone to touch het shes bitten him! Has she been injured or is this all anxiety for me leaving her? I did live here for 6 mths but nothing changed..
We suggest taking your cat to the vet to make sure there is no underlying problem.